What fun is the rebooted Lost in Space on Netflix. No more the campy Irwin Allen adventure, nor the dark, bleak feature from 1998, this 10 part series strikes an inspired balance of Saturday matinee family adventure but with adult sensibilities. Yes there are wholesale changes, notably with Doctor Smith as female and a new backstory for the Robinson clan, but they work if you are detached enough to come at this from a new perspective. Episode 1 establishes the core relationships of the Robinsons, leaving Doctor Smith and Don West as footnotes with a sign of more to come. In this age of empowerment, it is Maureen Robinson (Molly Parker) who steps up as leader. As a gifted aerospace engineer with a nous for solving just about every problem -and the maternal instincts of a doting mum- she and husband John Robinson (Toby Stephens) are bringing their children to a new colony as part of the mother ship Resolute. But when disaster strikes they crash land on an icy, unknown planet which throws Judy Robinson (Taylor Russell), Penny Robinson (Mina Sundwall) and Will Robinson (Maxwell Jenkins) into all kinds of jeopardy. While Judy is awfully young to be the ship’s medical doctor, she is also the perfect daughter, much to the consternation of middle child Penny (aka Jan Brady?). The young cast are all given sufficient screen time to allow individual ties, with a bright-eyed Will stumbling across his new best friend in circumstances fitting of Androcles -and yes “Danger Will Robinson” has not been forgotten. The highly-underrated Parker Posey breathes new life into Doctor Smith, duplicitous without needing to twirl any villainous moustache -just don’t expect to hear “bubble-headed booby” anytime soon. Ignacio Serricchio isn’t given much to work with as a Latino Don West. 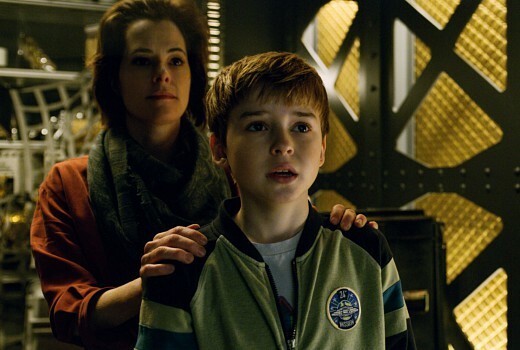 With the exception of young Maxwell Jenkins proving what a find he is, Lost in Space belongs to the female performers. Molly Parker (House of Cards, Deadwood) isn’t about to take the back seat June Lockhart occupied in 1965. She upstages Toby Stephens who spends too much time brooding and whispering for my liking. The script by Matt Sazama & Burk Sharpless (Dracula Untold, Gods of Egypt, Prison Break), enthrallingly directed by Neil Marshall (Game of Thrones), also draws upon Lost-like flashbacks which enhance or reconfigure the context for the audience. Visually this makes the most of its Canadian forest locations, with a touch of Halo-design and the music is positively grand -it screams John Williams. Like the Doctor Who contemporary reboot, Lost in Space brings a TV favourite to a new generation, finding new beats in the story with a nod to the past (watch for one cameo). This will please fans old and young alike. Lost in Space begins Friday April 13 on Netflix. Finally got to watch all ten. Can’t wait for next series , this show could go for light years. It is worth watching again, especially the very first scene of episode one. absolutely love the whole new concept. except the obvious lack of “frost vapour ” from their mouths in the ‘studio filmed’ closups when they are supposed too be in a below zero cave. very basic but annoying. Now watched all 10 eps. This got even better as it went on. Watched first five episodes yesterday, will do rest today…loving how they have kept the names of the characters and that they are lost and how they have changed it all but also loving more characters in the show…especially loving /hating the new Dr Smith ! I’m up to the 4th and enjoying it too. I struggled a bit during the first episode, thought it was too much disaster and not enough story, but episodes since have helped the story come along. I like the story twist on the original and the Jupiter 2. Yes Dr Smith has been written well. Penny and Don also have a bit of attitude which I quite like and the new robot… well let’s just say I want one! Finished it, loved it, looking forward to next season and yes I want one of those Robots too ! In the original movie length pilot, Judy Robinson’s stated field of study was ‘musical theatre’-this was changed to science when it was recut into 2 eps of the hour length series-had been indicated by a TV news voice over at the launch of Jupiter 2, so no reshooting needed. I’m looking forward to this. I was a big fan of the original, but view this as an entirely different show. Wentworth is a great example of how a ‘classic’ from our childhood can be invigorated and be relevant today. We all need to give it the benefit of the doubt until we watch it…..in reality I think we all want a 4, 5 & possibly 6 season with the originals but that aint gunna happen now! Kudos on the John Williams joke (he wrote the original theme). I know… but wasn’t a joke? Dr Smith is female…well that’s it for me folks. I wish when they revamp an iconic show they would stick to the original theme of it. Ditching a show on that one detail is actually offensive to anyone who owns a TV. Did you avoid Battlestar Galactica’s reboot because Starbuck was female, too? That show was such a triumph on almost every level (just don’t mention the last twenty minutes of the finale) with the female recasting as such an incidental footnote. Starbuck was a brilliantly flawed character. You missed out on thrilling sci-fi drama if you left it just because a character was a woman. I’m be going into Lost In Space with an open mind for a campy classic that has obviously evolved. Let’s hope the audience have, too.